With three different signature models on the table this year, the LeBron design team opted to make the LeBron 8 V/2 this year's KJSS sneaker. For the last couple of years, the Nike design team has issued special colorways of LeBron James' signature shoes to his sponsored AAU-affiliate, the King James Shooting Stars. 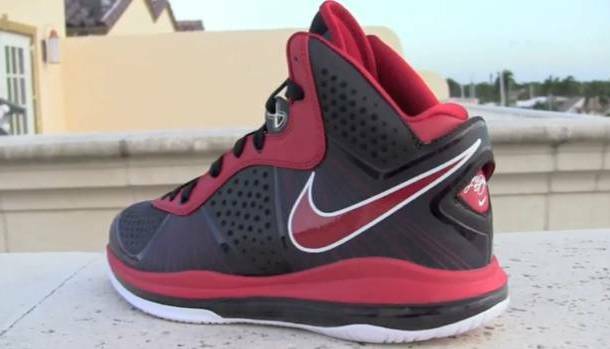 Past models like the LeBron VI and VII have taken on the team's familiar black, red and white color scheme, which stands out on the court during LeBron's Annual King James Shooting Stars Classic basketball tournament in Akron. With three different signature models on the table this year, the LeBron design team opted to make the LeBron 8 V/2 this year's KJSS sneaker. The KJSS LeBron 8 V/2, which was initially seen here back in May, features a black synthetic and mesh-based upper with working the eyestay, inner liner, Swoosh logos, heel and midsole. The 360-Max Air bag is blacked out, while white works the Swoosh border, heel signature and outsole. For a look at the KJSS LeBron 8 V/2 in detail, we turn to Stickie213, who got his hands on these rare kicks and dropped a video review for us to share with you. Check it out and let us know what you think.